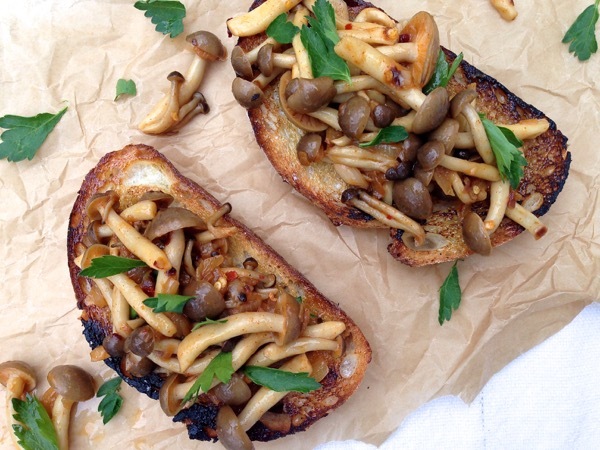 Mushroom Bruschetta, a true rustic Italian appetizer of garlic bread topped with wild mushrooms cooked in white wine! 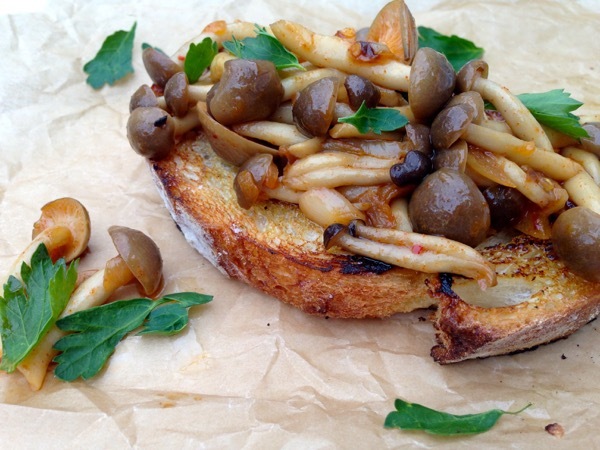 This wild mushroom bruschetta appetizer was first mentioned when I wrote the about Florentina page, here on Ciao Florentina. That’s where I first talked about my grandpa who would plop me on the back seat of his old rusty bike after the rain, and we would go search for wild mushrooms. 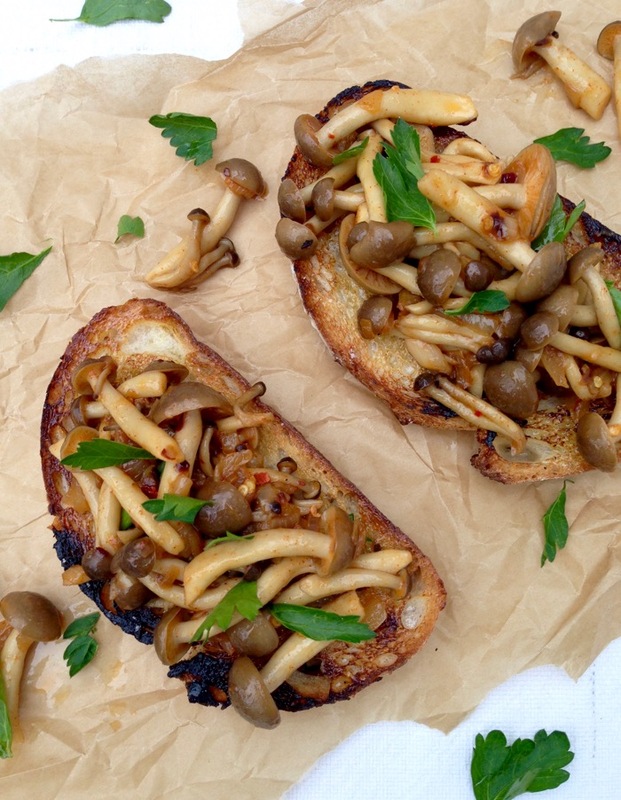 So we could make this exact mushroom bruschetta. I call it an appetizer, but for us it was the main dish. The cold damp weather did not stop this adventurous little kid, from crawling between thorny bushes to find priceless wild mushrooms. Because the way grandpa cooked those mushrooms the moment we got home, was like a dream. So it was about time I shared this treasured recipe. His wild mushroom bruschetta is one fit to serve to a king. 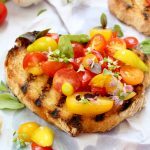 There are quite a few bruschetta, crostini and panini recipes on this blog, but this particular bruschetta appetizer takes the cake. 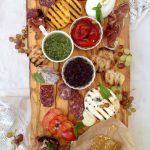 It is as rustic as it gets (duhh it’s bruschetta after all), with a wild soul of its own. Onions, garlic and a splash of wine, maybe a little bit of fresh thyme or parsley, whichever you have on hand, and how could that not be insanity ?! The wild mushrooms are the ones that bring that ” je ne sais quoi “ element to the dish tough, so it is really worth splurging on the best you can find at the market. 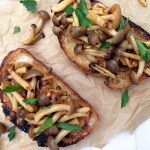 I do like to call this a wild mushroom bruschetta appetizer, just because it makes for a gorgeous introduction to any dinner. But really, this could really be the main course on its own. 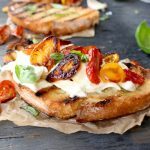 Wild mushroom bruschetta appetizer makes for a great name on any home menu, and will transform your weeknight dinner from good to fabulous in a matter of minutes. Simple rustic food is always the best food! And something really magical happens the moment you first rub that crusty bread with a garlic clove, then pile it up with wild mushrooms cooked in white wine. In a large skillet heat up 3 tbsp of the olive oil and add the onion with a pinch of sea salt. Cook until translucent and starts to get a little color. Add the minced garlic and give it a good stir. Add the wild mushrooms to the skillet, together with the paprika and red pepper flakes. Stir to combine and pour in the wine. Allow it to simmer together on medium flame until the wine has reduced almost completely, about 5 minutes. Adjust seasonings to your taste with more sea salt and sprinkle with the parsley or thyme, reserving some for garnish. Meanwhile heat up a cast iron grill pan on medium high flame. When the grill is hot add the bread slices. Cook for about a minute or so each side until nice grill marks form. Take the whole garlic clove and rub it over the grilled bread. Brush each slice of bread with a little olive oil and a pinch of sea salt. 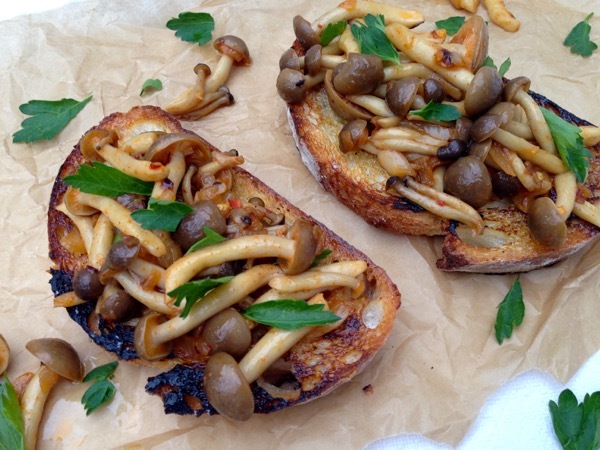 Spoon the wild mushrooms over the bruschetta and garnish with the parsley. Finish with a nice drizzle of extra virgin olive oil. Ha! My grandpa took me mushroom hunting as well 🙂 In true Grandpa fashion he always told me I was such a good mushroom hunter because I was so much closer to the ground. Mushrooms are my favorite food to this day. 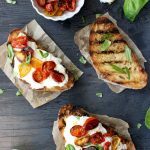 This bruschetta reminds me of our visit to friends in Ukraine. Yuri’s mother was so proud of all the mushrooms she’d gathered from the hillside and was heartbroken to hear we couldn’t take them back to Australia. No worry though, we ate them all that night, including a bruschetta. 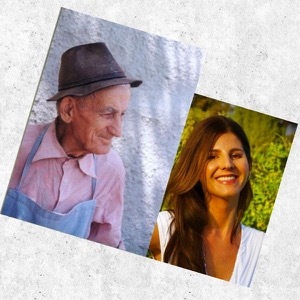 That is so sweet, I love that you went mushroom hunting with your Grandpa. Perhaps having those experiences from a young age would have meant I enjoyed them growing up too. Ooops, spent many a year until only a few ago not liking them at all. Now however…. cant get enough! 🙂 Add an egg to this and I am in heaven. Such a gorgeous appetizer! My family loves mushrooms! Gotta try your recipe this weekend.